For three months in a row now the Home Office has turned away fully qualified doctors from overseas who have applied for jobs here. This is a direct consequence of the Tories’ failed immigration policies, and we are all paying the price. It’s possible that EU some nationals could be less keen to come here as Brexit approaches. But it is definitely the case that the NHS is in a recruitment crisis. This is crucial in an area where there are already tens of thousands of vacancies. At the same time, many non-EU nationals also work in the NHS and it would struggle desperately without them. But the government’s ridiculous policy of a net migration target, which it has never come close to reaching, is undermining the NHS. Under the tiered visa system for workers, only a certain number is allowed to come each month. Once that target is hit, the Home Office turns away doctors. We are all worse off as a result. The simple and immediate answer would be to exempt all NHS employment from the Tier 2 visa cap. That at least would relieve some of the pressure on the health service and end the Kafkaesque nightmare where one part of the public sector, the NHS, is asking people to come here while another is refusing them entry via the Home Office. But this is a general problem affecting very many different parts of the economy and our overall well-being. Crops have literally been left in the ground as a result of the government’s ending the seasonal agricultural workers’ scheme. Many other employers argue they are facing both jobs and skills shortages. And Theresa May is almost alone in her own Cabinet in attempting to keep international students out of the country and insisting on their inclusion in the net migration target. All of these positions are hugely damaging to our prosperity. Labour’s values are diametrically opposed to these Tory ones. We do not start from targets, but from what is necessary and what benefits us all. We will never scapegoat, but will instead set our policies with jobs, living standards and prosperity as the priorities. It is the politics of ‘for the many, not the few’ applied to immigration. Despite the huge advance in 2017, there are still those who claim that if Labour shifted rightwards on this issue we would win votes. There is no evidence for this at all. In the recent past we did take this approach – it simply benefited all our political opponents who run a constant campaign against immigration. They use scapegoats for having no policy to get out of the economic crisis. Unfortunately, some in our Dutch, French and German sister parties tried this approach in their own elections in 2017 and it led them to electoral disaster. Labour’s values, which we can all unite around, are jobs, growth and prosperity. Immigration policy must fit into that, and complement that overarching objective. We must never do what the Tories have done – to subordinate the well-being of the population in pursuit of a failed net migration target. These are Labour values applied to immigration, and they are winning ones. Diane Abbott is shadow home secretary and MP for Hackney North and Stoke Newington. 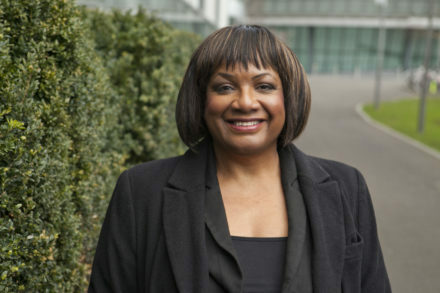 Diane Abbott is Shadow Home Secretary and has been the MP for Hackney North and Stoke Newington since 1987.